Riding a motorcycle is not about starting at A and arriving at B. 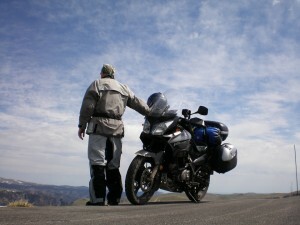 It's about the transformation of yourself that can only occur when traveling on two wheels. The trip ranged from sea level (the Oregon coast) to 14,115 feet (Pikes Peak) and saw temperature extremes from the upper 30's (Beartooth Pass, Montana) to 120 degrees (Zion National Park). The farthest south was Kaibito, Arizona, the farthest east was Mt. Rushmore, South Dakota, and the farthest north was Missoula, Montana. From a gear standpoint, my bike -- a 2007 Suzuki V-Strom 650 -- ran without complaint. In the 5,000 mile journey it used up about 3/4 of quart of oil (which is pretty normal for modern bikes). The odometer rolled over 50,000 miles during the trip. My Garmin Zumo 450 GPS half-died about 1,000 miles into the journey. It's 5 years old so that's a pretty good lifespan for an electronic gadget that gets exposed to the elements. The standout gear of the ride, however, were my ExOfficio convertible pants. I wore them under my Firstgear Kathmandu riding pants and made the trip a lot more comfortable, especially when riding in high desert heat. They retain zero odor, and I could wash them in my motel sink, ring them out (roll them up in a towel and step on it) and they'd be dry in a few hours. Plus they are super light and pack really small, which is a huge bonus when traveling by motorcycle. The trip went without a hitch, basically. There were no pucker moments or involuntary get-offs and no run-ins with law enforcement. It barely even rained -- a few drops while visiting Mt. Rushmore. Speaking of Mt. Rushmore, it was probably the biggest disappointment of all the big-name places I visited. It's much smaller in person than I thought it was from all the pictures and video I've seen of it on TV. In fact, the rock formations surrounding the monument are far more interesting. Devil's Tower in northeastern Wyoming was kind of a 'meh' moment, too, not because it isn't cool -- it is -- but because it's exactly like I've seen in Close Encounters of the Third Kind. It was a kind of "Been there, done that" sort of moment. I hadn't planned to visit Zion National Park but had to detour that way because of a road closure. Wow, what a place! I realize it's cliche to say so but pictures can't begin to do it justice. It's as if Mother Nature consulted some big-name Hollywood filmmakers when designing it. One thing that kept crossing my mind was the viewpoint that several fundamentalist Christians hold concerning the age of the earth. I'm all for the freedom to hold personal religious beliefs, but anyone that thinks the planet is only 7,000 years old is exhibiting a willful denial of reality bordering on malignant ignorance. Just travel around the west and look at the mountains that were built up, eroded away, and built up again and see if that kind of geological activity could happen in a few thousand years ... or even in a few million. Wake up. It's okay if the planet is 4 billion years old. Really. It won't make you any farther from God to acknowledge what is obvious. If it makes you feel any better, remember what an old friend of mine used to say when asked about his view on dinosaur fossils vs. the Bible, "I don't know how it happened, I just believe God was involved." When I go on these trips, I am often admonished by friends and family to takes lots of pictures. I took some, and I even took some video. In my tank bag was a GoPro HD camera and while riding I would often take it out and hold it with my left hand, filming various angles of the action. I've reviewed some of the footage and it worked pretty well. I plan to turn my photos and live footage into a produced video, with distribution to select individuals. Some photos will be posted here, but don't expect too much. Philosophically, I have been taking the attitude that these places aren't going anywhere; if you want to see them, go there yourself. I put in a lot of time, money, and sweat riding there and I feel somewhat reluctant to let others vicariously enjoy the benefits of that journey without paying some dues for the privilege. Sorry, but that's just how I feel. Meanwhile, my bike is filthy and needs an oil change. My chain is also in dire need of replacement and my Aerostich Darien jacket looks like it's been to the moon and back (I love that jacket!) I also have 7 GB worth of video to edit. I'll report back when I have something to report.